Let me preface this with a confession. Part of why I’m so excited to be a mom is to finally have an excuse to go crazy with the party planning. I think I do a pretty good job entertaining our grownup friends, but the options for kid parties are just neverending. This is not the sole reason I wanted to start a family, but it certainly doesn’t hurt. Don’t get me started on the sewing options for homemade Halloween costumes. This Mommy business completely appeals to my inner home ec goddess. I love Amy Atlas. I’ve been a big fan of her dessert tables for a few years now, and I’ve made my own shaky attempts at putting them together for our parties and cookouts. So I preordered Sweet Designs as soon as I heard about it, and I wasn’t disappointed. Finally I can get some insight into why my own tables never quite look like hers. I’ve learned that I should overstock the table even if it’s for a small crowd…this is why mine often look emaciated, I’m afraid to have TOO much. Mixing supermarket treats with homemade nibbles and gourmet goodies is perfectly acceptable! I do not have to spend a fortune or weeks of my life in the kitchen prepping for parties! I can finally feel comfortable busting out my Cricut for decorations without worrying about being too cutesy! I need to find my hot glue gun! Anyway, you get the idea. 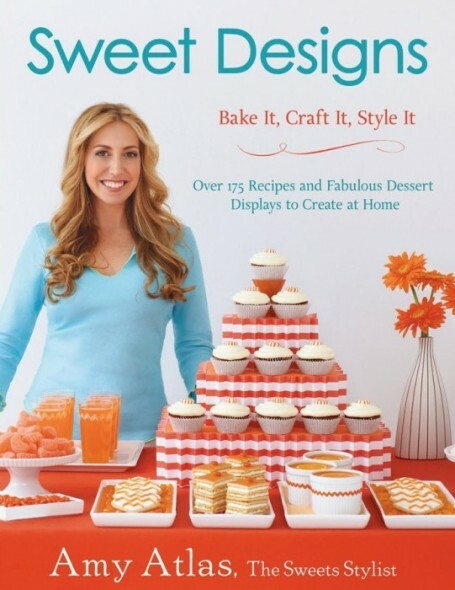 The book features 14 fully styled dessert tables with step-by-step instructions for recreating them at home. But it’s not just a cookie cutter manual. The idea is to be inspired by the spreads and put your own spin on them. Amy’s packed it with tons of tips, including her list of favorite suppliers (thank you thank you!). There are recipes and templates, and encouragement to try out small-scale touches to make even regular weeknights a little jazzy. I haven’t had much free time since H was born (I can’t believe she’s 3 months old already! ), but I did take the small-scale advise to heart and tried out one of the recipes from the book just because. About a month ago I made the Caramel Buttercream from the “Grandma Dotty’s Rocky Road Cupcakes” recipe. 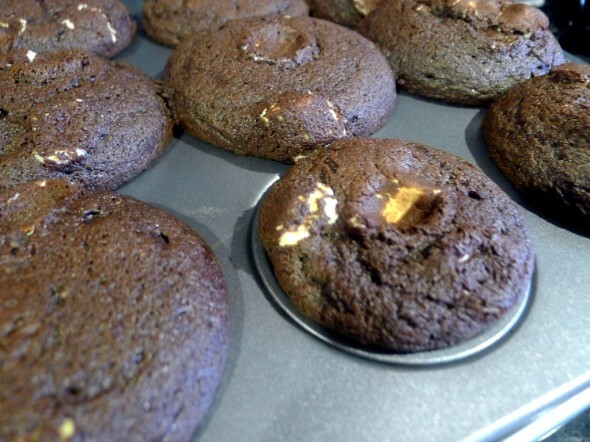 Adam’s a little funny about stuff in his cupcakes, so rather than make the chocolate chip-filled, Marshmallow Fluff-stuffed Rocky Road cupcakes I used our go-to Dark Chocolate Cupcakes recipe. I didn’t have any Fluff anyway, but at the last minute I thought I’d see how he did with some mini marshmallows in the batter. Result: he didn’t mind them, but they also basically disintegrated and brought nothing to the table. If anything somehow the cupcakes were drier than usual. 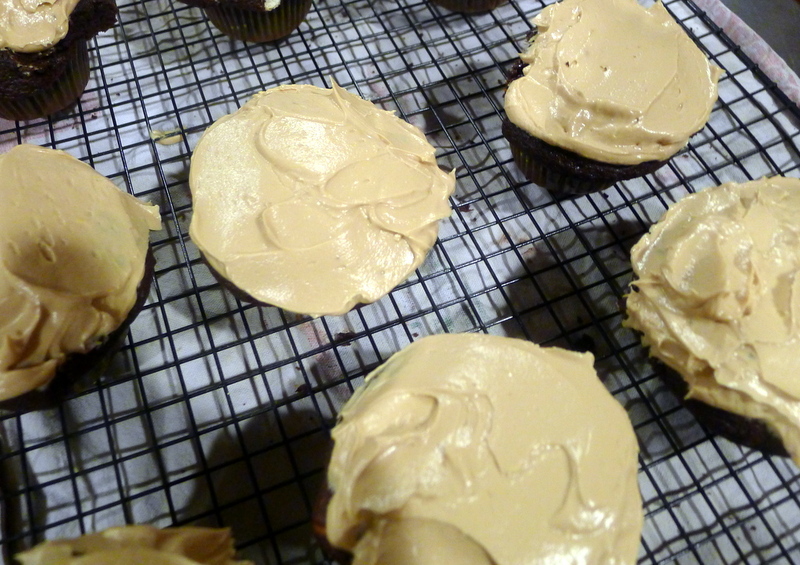 Anyway, I did make the Caramel Buttercream frosting, and it was absurdly good. I love making caramel, and this actually made me start feeling like my old self again after weeks in the Newborn Zone. With the 4th around the corner, our summer party-planning is in full swing. I can’t wait to bust out some more tips and tricks.